Fire pits are one of the most popular features in backyards throughout southern California. In fact, the American Society of Landscape Architects recently named outdoor fire pits the most popular design feature for outside the home all across the nation. There are few things more pleasant than a cookout outdoors in the summer. But homeowners need to be aware of the dangers fire pits pose, especially to small children. Last year, fire pits and outdoor heaters were associated with roughly 5,300 injuries that caused people to go to emergency rooms nationwide. That’s a dramatic nearly 179% rise from 2008 levels, when 1,900 injuries occurred. Of these, 25% were children less than 5 years old. Burns can be extremely severe, requiring skin grafts and surgery. Not only that, but, as NBC News points out, many parents say their child was injured in what seemed to be a matter of seconds. Parents need to follow safety precautions to make sure that no one is injured in fire pits. Those with fire pits need to follow recommended procedures for safety. 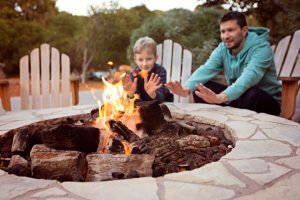 Keep children and pets at least 10 feet from a fire pit. Supervise children at all times whenever you have a fire pit going. Make sure that all your children know the rules of being around a fire pit. Remember that coals can be hot the next day. Make sure that all children know this, as many burns of young children happen the next day. Check with local authorities to make sure a fit pit is legal in your area. Check to see whether weather conditions are regulated. Wind, for example, can cause fire pit fires to blow, so some local authorities regulate when pits are safe to use. Load the fuel safely. Don’t load so many wooden sticks that there is a danger of them falling out. Make sure the pit is a minimum of 10 feet from anything flammable. Keep extinguishing material nearby in case the fire flares up or catches on something. Depending on your fire pit model, this could be sand, water, or a chemical fire extinguisher. If you or a loved one has been injured by a fire pit, call us to discuss your case. The Ellis Injury Law Firm has been protecting people from personal injury in the Los Angeles area for more than two decades. Our product liability lawyers can determine whether defective manufacturing or inadequate safety instructions may have contributed to you or your child’s injury. Our consultation comes at no cost or obligation to you, and we charge no fees unless we win money for you. Call 310-641-3335 today!